Turtz on the Go: New 7 Wonders of Nature Provisional Winners - Puerto Princesa Underground River Included! 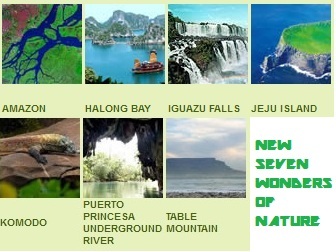 New 7 Wonders of Nature Provisional Winners - Puerto Princesa Underground River Included! The organizers of a global poll thru Bernard Weber, the Founder-President of New7Wonders announced the provisional winners of the New Seven Wonders of Nature early Saturday at the N7W Headquarters in Zurich, Switzerland after the first count of votes. Fortunately, Philippines' Puerto Princesa Underground River also called as Puerto Princesa Subterranean River National Park was among the world's new 7 wonders of nature. “We congratulate each of these participants on achieving their provisional New7Wonders of Nature status, and look forward to completing the confirmation process to celebrate each one in their own Official Inauguration ceremony early in 2012,” said Weber. “When the New7Wonders of Nature are confirmed they will join the man-made New 7 Wonders of the World in becoming part of Global Memory for humankind for ever," he added. Meanwhile, in a statement on Saturday, Malacañang said it was "heartened" by the results of the global poll. “We congratulate everyone, especially the people, who made this all possible. With this, we sincerely hope that the rest of the world will stand up and notice the majesty not just of the underground river but the rest of the Philippines,” said Presidential Spokesperson Edwin Lacierda. The final results will be announced early 2012, said Swiss foundation New7Wonders, warning however that there may be changes between the provisional winners and the final list. The poll results will undergo a rigid validation and verification process before it becomes official. The final results will be announced early 2012, said Swiss foundation New7Wonders, and will then work with the confirmed winners to organize the Official Inauguration events.